The Patterson House was built in 1926 as a single-story, six-room home. At a later time a laundry room was added off the kitchen at the rear of the house. This has been the only change to the exterior of the house. The house maintained its original floor plan until 1998 when the house was purchased by Susan Mitchell, who made extensive changes to the interior including turning the attic into a living space and updating the plumbing and electrical. The house now has two-stories, with four bedrooms, three baths, and a formal dining, kitchen, living, laundry, and family room. R.L. Waddill was a graduate of Princeton University and practiced law in Kentucky be- fore arriving in Collin County in 1853. By 1860, he became the District Judge. In that same year the Judge purchased 50 acres from the tract originally granted to T.T. Bradley in 1855 for a total of $1500. The Judge divided the property and began selling lots in what is now known as the Waddill Addition. Robert F. Newsome was born in McKinney on April 24, 1895 to E.A. and Laura Fitzhugh Newsome. Robert F. Newsome has the distinction of being McKinney’s longest serving mayor (1 945-1 955). He was an active civic leader and served on many boards, including the Texas Municipal Water District. We was the nephew of W.B. Newsome, chair- man of the Federal Reserve Bank in Dallas. Robert F. Newsome had a prominent insurance business and was one of the most frequent advertisers in the Courier- Gazette. In 1924, Mr. Newsome sold W.C. Patterson the lot that he would later build his house on. At the time of his death Mr. Newsome resided at 609 West Tucker. business his great-uncle had started in 1872. Lee Elliott, Jr. was involved in a great many building projects in McKinney, including rebuilding the Texas Textile Mill after the 1948 tornado and adding 72 mill homes in 1950. Other local projects included work on the Veterans Hospital and the hundred-unit housing project by the Housing Authority of McKinney in 1951. Lee Elliott, Jr. lived at 11 04 West Louisiana before moving to Dallas in 1952. W.C. Patterson was born at Comanche Springs near McGregor, Texas. At seven years of age his parents moved to Lampasas. There he married Alby Senterfitt in 1902. On New Years Day in 1918, he married a second time, this time to Lily Burleson of Liberty Hill. By Valentine’s Day, he brought his new bride to McKinney and bought Standard Garage with Aubrey Hamilton. Mr. Patterson operated the Standard Garage in the building owned by Jas. H. Merritt at 210 N. Tennessee. His garage was next door to the town’s two newspapers and across the street from the store owned by Martin Moses, another Lampasas native. Gasoline rationing and war-time economics took their toll on the business leading Mr. Patterson and his partner to sell their stake in the business to J. F.Chandler in the Fall of 1921. Looking for new opportunities, Mr. Patterson joined up with Jim Vaughan in the oil boomtown where Conrad Hilton got is start in the hotel business -Cisco, Texas. Jim Vaughan sold his business, Vaughan’s Drug Store, in McKinney to purchased the drug store his father owned in Cisco. In 1923 Mr. Patterson returned to McKinney to re-establish his partnership with Aubrey Hamilton to start the Hamilton-Patterson Motor Company in the same location they operated the Standard Garage three years earlier. This time, as dealers for Overland and Packard automobiles, their business became a great success and one of the Courier Gazette’s best advertisers. Their ads appeared regularly in newspapers for the next three decades. Frank W. Smith was born and reared in McKinney and attended McKinney High, After graduation in 1914, he attended Massie Business College in Houston. He returned to work for a time with the McKinney Ice & Coal Company. In 1922, he took the position of head bookkeeper at the Texas Textile Mills, Inc (McKinney’s largest employer). He would later go on to become the superintendent of the mill. He lived at 1007 Tucker Street before buying the Patterson House in 1942. While living on Waddill Street, he led several civic organizations including the Lions Club, the Quarterback Club, and the Greater McKinney United Fund as president in 1959. In 1970, Frank and his wife Willie (Sherrod) celebrated their 50th wedding anniversary. Russell 0.Wilson was born on Nov. 16, 1914, in Princeton to Roscoe and Lulu Wilson. 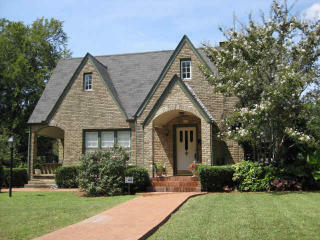 The family moved to McKinney where Russell graduated from Boyd High School in 1933 and attended Texas A&M University. He worked as a bank bookkeeper before spending 44 months in the service. He married Emalou (aka Sally) McMurray on July 20, 1947 (his second marriage). In 1950, he was named vice-president of First National Bank of Paris (Texas). In 1951, he was named in a six-count indictment for embezzling $9,700 from the bank’s accounts. He was given a five-year suspended sentence and fined $5,000. He returned to McKinney and in 1957 purchased the Patterson House from Frank Smith. He lived there with his wife for nine years and worked as an estimator for Texas Bitulithic Company. He was a member of the First Christian Church of McKinney. Tenant history Is same as owner history. The pioneer families of the late 19th century moved to McKinney because of the opportunity the land offered. However, by the first decade of the 20th century, people were moving to McKinney because of opportunities the growing city offered. During this decade the city witnessed the construction of a library, a power plant, a sewage system, and a phone company. This building activity attracted entrepreneurs who started car dealerships, funeral homes, lumberyards, processing mills, and retail stores. One ambitious man who felt the magnetic pull of McKinney was Walter C. Patterson. On New Years Day in 1918 he married Lily Burleson in Liberty Hill in Williamson County, Texas and by Valentine’s Day had brought his bride to McKinney and purchased Standard Garage at 210 N. Tennessee with his business partner Aubrey Hamilton. The Courier-Gazette claimed this to be “one of the largest deals made in business circles in McKinney for some time.” Mr. Patterson’s new business was located in the Merritt Building, especially constructed for the garage business. The business experienced financial difficulties early on and was actually sold to John F. Chandler in 1921. However, two years later Mr. Patterson formed a new business partnership with Aubrey Hamilton and Grover Purr and bough the business back. The new business became Hamilton-Patterson Motor Company and one of the largest car dealers in town selling Packard, Overland, and Chrysler automobiles. It was also one of the best located since it was near the McKinney Square, next door to the newspaper and just around the corner from the Neo-Classical Revival style Central State Bank building. R.F. Newsome who would later go on to be McKinney’s longest serving mayor. In January of that year Mr. Newsome posted a classified ad in the newspaper advertising a lot for sale in Waddill Heights at a “pre-war (WWI) price.” The lot was located in the desirous Waddill Addition at 315 N. Waddill Street. The higher elevation there provided nice views of the growing downtown. Mr. Patterson bought the property for $1,335. The year Mr. Patterson bought the property many city road construction projects were under- way in McKinney including paving Hunt and Waddill streets. In February of 1926, Mr. Patterson contracted with Lee Elliott, Jr. to build his house. Mr. Elliott was the great-nephew of J.T. Elliott of Dallas who had lumberyards in Dallas and McKinney. Lee Elliott, Jr. grew up in the lumber business but left if for a few years when he married Virginia Massie of the Massie Funeral Home. When he returned to the lum- ber business he would go on to become one of the most prolific builders in McKinney. He was responsible for nearly 100 homes not to mention repairing the Texas Textile Mill after the 1948 tornado, and the 72 mill-homes his company constructed. 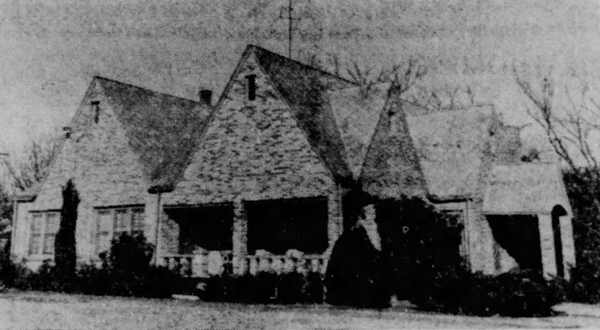 In June of 1926 Mr. and Mrs. Patterson moved into their new home which the Courier-Gazette declared as “one of the nicest and most modern in our city.” This is ironic considering the house was of a Cotswold Cottage style that took its inspiration from Medieval England. The designer of Mr. Patterson’s house is unknown but the style is similar to the English Cottage Style homes popular in Dallas at the time. This style goes by several names including Cotswold, and Storybook. It is related to the Tudor Style but tends to feature brick and stucco facades rather than the traditional cross timbers. The style is known for its steep gables, arches, and swayback roofs covered with slate – in a word, quaint. Given the builder’s business connections in Dallas and the fact that Mr. Patterson lived there before moving to McKinney, it is possible that the home if not designed by a Dallas architect, was inspired by one of the many such homes find on Dallas’ M Streets. The house at 315 N. Waddlll St. is exceptional in its concept and design. While it possesses the steep gables and swayback roof that is common to this style, the application of gables makes this house unique. Normally, a Cotswold house will feature a main gable flanked by a smaller one with a chimney somewhere in the mix. However, the Pat- terson House has symmetrically paired gables on three sides of the house. The rear of the house changes up this pattern by applying nestled gables instead. This creates a complicated roof plan made up of nine gables. The roof line is purely stylistic. At the time of the home’s construction, the gables were strictly ornamental. There was nothing about the floor plan that required such roof lines and it was only much later that the attic space created by these tall gables was adapted for living. Lee Elliott worked at Reliance Brick Company in Dallas for two years and would have learned much about the material. The brick he used on the Patterson House was a new brick that the Acme Brick Company had developed in 1924 called “carpet” brick from kilns in Perla, Arkansas. The name comes from the rough and porous texture of the surface of the brick. The bricks are used ornamentally above windows in the gables and around one of the chimneys as well in the two arches on the east face of the house. Brick does not lend itself well to spanning large, open penetrations. However, in the Patterson House the brick does just that. Given the home’s wide openings for the double- hung windows and the wide expanse between the porch columns on the south side of the house, the use of brick is novel for the style. Perhaps it is this brick feature that led the Courier-Gazette to praise the house’s modernity. Walter C. Patterson died on Feb. 20, 1940 at the age of 60 due to complications from an appendicitis surgery he had the previous October. His widow, Lily, would live at 315 N. Waddill another two years before selling to Frank W. Smith and his wife Willie. At the time of the sale, the Frank Smith was the well-known superintendent of the Texas Textile Mill, a company he had been employed at for 20 years. He had started there in November of 1922 as a bookkeeper after working for the McKinney Ice & Coal Company for three years. When Mr. Smith joined the Mill, it was already Collin County’s largest industrial enterprise employing 200 people. In 1930, Mr. Smith became the Mill’s superintendent, a position he would hold longer that anyone in its history. While under his supervision the Mill experienced two world wars, a Great Depression, a tornado, and perhaps most challenging of all, labor issues. Despite the challenges, the Mill thrived and in 1948, be- fore the devastating tornado blew the Mill’s roof off, it employed over 600 people. Mr. Smith’s success at managing the Mill afforded him the resources to buy the Patter- son house and move from his bungalow cottage at 1007 Tucker St., which had been the family home for nearly 20 years. As a testament to Mr. Smith’s business acumen, the house he purchased from Patterson’s widow for $2.325 he sold to the next owner for $1 6,500 in 1957. The following year Frank Smith retired from the Mill after 36 years of employment. In the early afternoon of April 30, 1958, lightning struck at 315 N. Waddill. The Courier- Gazette reports, “A chair was hit by the lightning, knocking it into a floor furnace which also caught fire. A hole was burned in the floor where the lightning struck, and consider- able water and smoke damage was done.” The Wilsons would live at the Patterson House until selling it in 1966. At the beginning of the 20th century, the McKinney’s economy was stronger than a loco- motive. Cotton was growing faster than a speeding bullet. Business opportunities were leaping three-story brick buildings at a single bound. The city was a super magnet for entrepreneurs. The Patterson House at 315 N. Waddill Street is a perfect example of this new phase in McKinney’s development. It epitomizes all that McKinney wanted to be -solid as brick and modern as Dallas. With the growing resources and materials available, houses in McKinney became more sophisticated and architecturally expressive. Just the thing successful business people new to town were looking for. The Patterson House is unique in its form and modern in its materials. It is not surprising that in the first half of the 20th century the Patterson House would be home to fami- lies involved in three of the most powerful economic forces shaping McKinney -automobiles, textiles, and banking.